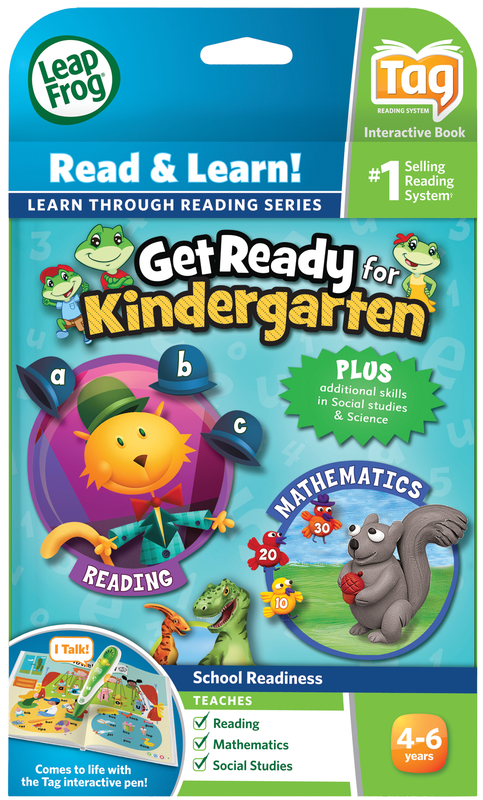 Get Ready for Kindergarten helps kids build fundamental school readiness skills! In Word Circus, children use consonants and vowels to build a variety of one-syllable circus-themed words. In Monster Math, kids count sets of candy up to 10 as a monster loads the pieces into its bag. Kids also learn to recognize dinosaurs, identify their people and places in the community, understand the seasons and explore different instruments. Other entertaining activity pages teach word building, comprehension, pattern recognition, skip counting, calendar skills and beginning social studies concepts. The Tag System helps children develop and strengthen critical reading skills, and the Learn through Reading series is designed to help them apply those skills to explore topics like science, geography, writing and more. Parents can connect the device to the online LeapFrog Learning Path to see what their child is playing and learning. Appropriate for children ages 4 to 6 years. For use with the LeapReader and Tag Reader pen only. LeapReader or Tag Reader pen is required and sold separately.